Handmade housewarming gifts that are really useful are always well received.These lovely lamps and colourful shades can be created to match existing colour schemes or as stand-alone pieces. Lamps, odd shades and the fabric to cover them can all be picked up for very little at markets and thrift shops. Make sure that the electrics and fittings are of the modern type and take them to a lighting shop to be checked if you are in any doubt. 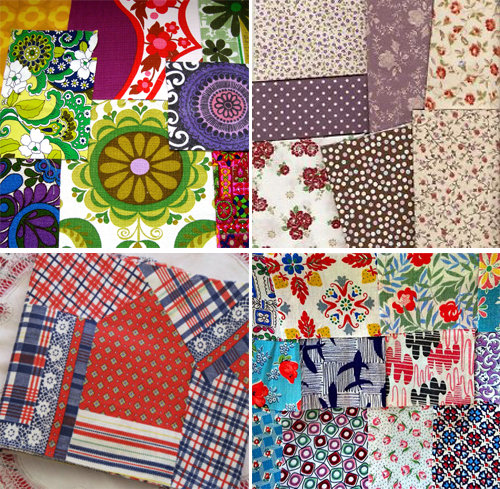 If you sew often, you will have lots of scraps of fabric that are left over from various projects. 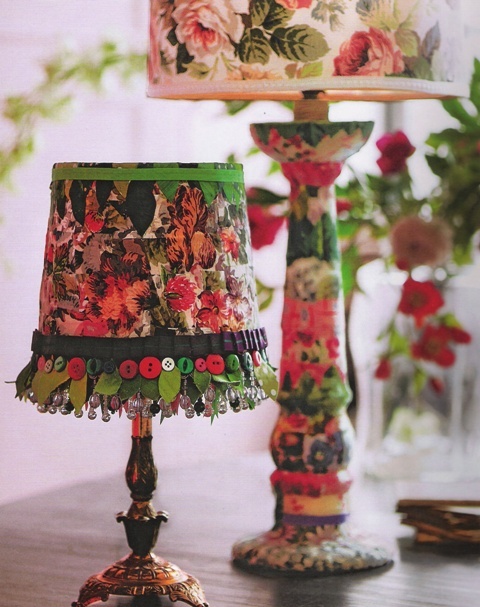 Even the smallest inch of pretty fabric can be used to transform lamps, lampshades, trays and even whole pieces of furniture into something beautiful. Choose fabrics that go well together, or that share a similar background colour or design. 1 Trim the fabric scraps into little squares, with pinking shears if you like. 2 Paste PVA glue onto the lamp base and then start adding the squares of fabric, one next to the other, to create a layered patchwork that covers the existing finish. Change the fabric every so often as you progress up the lamp and make sure that the pieces overlap each other slightly so that the whole surface is covered. 3 Add strips of ribbons, lace and cut out fabric leaves and flowers to the covered base by pasting them with lots of glue, and sticking them to the patchwork. When you have finished, paint a coat of PVA over the whole lamp and leave it to dry. 4 Choose a lampshade that has a taut, plain fabric finish, or one that is made of stiffened card covered in fabric. Cover it with a patchwork of fabric in the same way as for the lamp base, and finish the top and bottom edges with glue-on lengths of ribbon to make it look neat and tidy. You can also add some bobble trim in traditional lampshade style.